In February 2019 Charlie Kirk, president and founder of Turning Point USA, made claims about some of the 2020 presidential candidates for the Democratic Party. I want to fact-check those tweets. The bill calls for prison time and fines for any doctor who does not “exercise the same degree of professional skill, care, and diligence to preserve the life and health of the child as a reasonably diligent and conscientious health care practitioner would render to any other child born alive at the same gestational age” and who does not also ensure that the “born alive” child is transported to a hospital. In terms of Kirk’s claim that a “no” vote is an allowance, the question becomes then: are there requirements on doctors through other means than this proposed national law to perform medical treatment in such circumstances? In other words, what is “allowing” or not allowing this? As one can imagine with abortion, it is a complicated mess. What both sides agree on is that an infant was born after an attempted abortion. And at some point later, some of those infants die. What happens or should happen between those two events is the debate of the bill. As supporters of the bill point out, this bill is not about abortion per se. Yet as Democrats note, such a bill could influence the decision. “Backing away” was part of the debate over a new law in New York that was signed by Gov. Andrew Cuomo in January. An anti-abortion activist in that state claimed that under the new law “a woman could give birth to a baby, and then, they have a discussion with the doctor, if the baby was born alive, they would just let the baby expire,” according to Politifact. Supporters of Sasse’s bill say those protections don’t go far enough. Ironically, in cases cited by anti-abortion activists as proof of infanticide after birth of an infant whose mother wanted abortion, doctors have been punished as the governor’s spokesperson said. According to the Associated Press, no criminal charges were filed against the doctor. But in March of 2009, that “non-licensed” person who was the co-owner of the abortion clinic where that event happened was charged with two felonies, according to CNN. It was the clinic owner who “cut the baby’s umbilical cord” and placed the “the live baby, placenta and afterbirth in” a biohazard bag, “which she sealed, and then threw bag and the baby in a trash can” according to statements given to police by the infant’s mother. The doctor said he was not told of the birth before he attempted the abortion, discovering the “fetus” was absent as he performed it. Sasse called a lack of treatment post-birth infanticide. In its fact-check, Politifact talked to Dr. Stephen Chasen, a professor of clinical obstetrics and gynecology at Weill Cornell Medical College, who is also on the board of Planned Parenthood of New York City. The doctor said that what happens after a birth from an attempted abortion is hospice care, not neglect. Under the hospice scenario, one might envision making an elderly patient comfortable but not taking active measures to stop the spread of cancer, for example, because it had spread beyond the ability of doctors to stop it. In the case of an infant, pro-abortion advocates point to the wishes of the mother for not extending “life-saving” treatment. Sasse’s bill would require medical treatment to keep the baby alive under any circumstances of its birth. In his description of “backing away,” it is unclear who or what is motivating that “backing away.” Or in Kirk’s words, who or what is “allowing” it to occur. Who or What Determines the Action of the Doctor? Who or what would change or has changed those standards? It seems to be the mother’s wishes. The concept of viability was a central definition in Roe v. Wade. Sasse’s bill does not literally address viability. He implies doctors of any infant born after an abortion at any week could and do “back away” but that does not seem congruent with at least some of the doctors in the Politifact article who seem to think about viability before treatment. Beyond medical judgment, the doctors cited in the Politifact article also imply scenarios where a mother’s wishes would prompt them not to perform treatment. Sasse’s bill would seemingly eliminate those wishes as part of the doctor’s consideration. And yet, oddly, the bill would ban prosecution of mothers who violated the bill’s language on ending the life of a “born alive” infant. Even more oddly, it would ban prosecution of mothers who participate in a “a conspiracy to violate this” bill. It does not say who might be in that conspiracy, which of course requires at least two people. But it seems if the doctor and mother decide together to not give “life-saving” treatment to the infant due to the mother’s wishes, the mother would not be prosecuted, but the doctor would, if indeed the doctor acted in accordance with those wishes. Finally, as for Kirk’s claim, the senators voted no on this bill. But was that vote an allowance for doctors in any state to “leave” to die a “born alive” baby of any gestation period? By law this practice is disallowed in many states. By medical standard, it is disallowed by the litmus test of viability. But there are moments where the practice is done, “allowed” by the mother’s wishes, most likely in those states where by law it is not banned. And there seems to be opportunities for that allowance based on the mother’s wishes implied in the statements from Democrats. Sasse’s bill seems aimed at those implied moments. The vote happened over a measure concerning the BDS movement, or the “pro-Palestinian “boycott, divestment and sanctions” movement, as Politico called it. Kirk asks why these senators voted “no” but misleadingly omits their statements on their vote. The Times gives the statements from all the candidates who voted “no” and they all noted their support for Israel or their stance against the BDS movement. The “private jet” claims stem from a Politico article on Feb. 25, 2019, published after Sanders announced his 2020 run. It is anonymously sourced by former Clinton 2016 staffers who said Sanders mandated a private jet instead of flying commercial for trips to stump for Clinton during the general election. According to the Clinton camp, they tried to get the senator to fly commercial but eventually ‘gave in’ to keep him happy. A Sanders spokesperson said the only way to get to all the stops for Clinton was to fly as efficiently as possible, in a private jet. Kirk again misleads when he doesn’t note who paid for the flights: other people, namely Clinton donors and the Democratic Party. Though Politico noted: “Sanders’ political committee transferred $100,000 to the DNC to share some, but not all, of the costs of” a April 2017 tour for the party. Kirk is trying to make Sanders out to be hypocritical for being against “wealth inequality” yet able to fly on a “private jet,” own three houses, and be a “millionaire.” I suppose then President Trump can’t “‘fight for the little guy” and also fly a private plane and have more than one house? On being a millionaire, Sanders reported on his required Senate income disclosure form that he had made over $1 million in 2016 and 2017. But Kirk is missing a key piece of context: one news site noted Sanders “historically has been among the least wealthy members of Congress. In 2014, for example, he earned little more than his congressional salary and had $330,000 in assets.” Most of the new income came from advances in books he wrote. On the three homes, they include “a retreat in the Lake Champlain islands” purchased in 2016, paid for with money from a family ancestry home in Maine that had been in his wife’s family for generations. Also, Sanders owns a home in Vermont and a small “row” home in DC, something he recently purchased after years of renting, according to news reports. I am not sure how honeymooning in the USSR makes someone a Socialist or disqualify them to be president. Finally, there is the claim by Kirk that Sanders has never held a “real job.” That must mean Kirk refuses to see civic service as mayor and Senator — which both pay a salary — as real jobs. But those jobs certainly qualify Sanders for president. As an aside, after college Sanders worked as a Head Start teacher, psychiatric aide, and carpenter, according to Politico. Kirk seems to imply a reference here to a 2017 viral image that blasted Democratic senators who voted “no” on a drug price bill but took money from the pharmaceutical lobby. That image had Booker at the top with “$385,000” in donations. It lines up with the voting results for an amendment voted on by the Senate on Jan. 11, 2017. The amendment is filled with legislative jargon, but it would basically create a mechanism to promote “lower prescription drug prices for Americans by importing drugs from Canada.” The measure failed, with 46 votes in favor and 52 against. The 13 Democratic senators targeted in the post were among those 52 votes against. As for the dollar figures, they largely align with donations listed on the OpenSecrets.org site run by the Center for Responsive Politics, an independent clearinghouse for campaign finance data. In every case, the dollar amounts listed track almost exactly the amounts given to each senator under the category “pharmaceuticals/health products” for the 2016 campaign cycle, notwithstanding a few small deviances. On Booker’s voting record on drug prices, he voted “no” on a measure to allow Canadian drugs to be imported into the US. Those drugs are normally much cheaper. 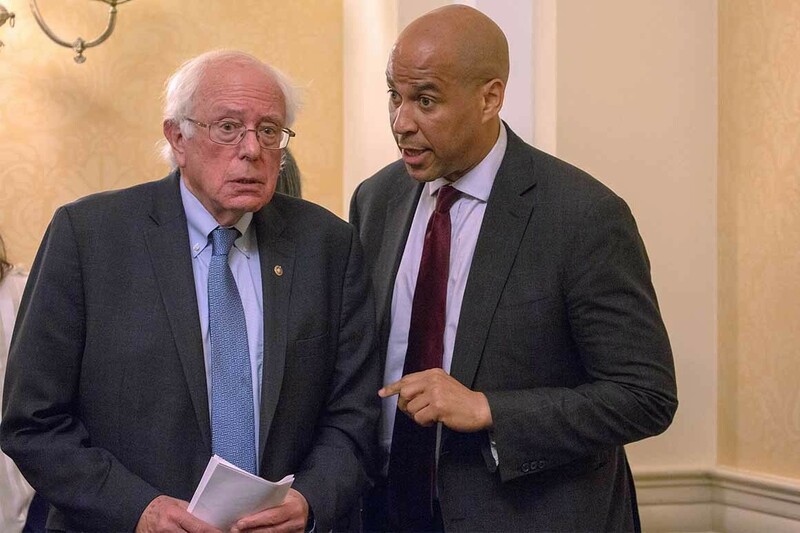 Booker worked with the sponsor of the importation bill, Bernie Sanders, to re-introduce the bill with more safeguards in February 2017. Now running for president, Booker has stopped taking “pharma” money, of which he took an enormous amount prior to 2016, prompting criticisms within his party that he was “too close” to the industry.